These days you offen hear or see the word ‘budget’ dotted around. Budget flights, budget supermarket products and more. But recently I was introduced to something I thought I’d never sign up to – budget hotels. 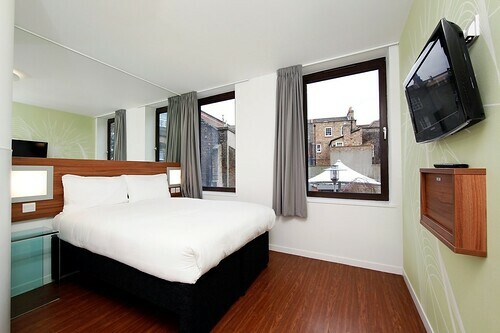 I was invited to try the newest addition to the Tune hotels portfolio in London’s Liverpool Street. At first I was skeptical but soon realised how handy it could be. I live in Wembley, which is right on the opposite side of London. So going out in East London is not exactly very appealing when you know you’ve got a two hour journey home at the end of the night. I decided to stay at Tune on an evening that I had planned to go to see my favourite DJ, Greg Wilson, play at Hoxton Pony. We were also heading to York the next day from Kings Cross, which is a few stops from Liverpool Street. As with most budget options, there are added extras. Remember that Ryan Air ‘pay to go to the loo’ saga? Well, Tune is no different. If you want a towel and soap, that will cost you (£1.50 per towel), if you need to use a hair dryer, that will cost you (£1 for unlimited use). Want to watch a bit of TV or listen to the radio while you get ready? That will cost you too (£3 per day). But as prices start from a mere £35 a night for the room, non of these extras will break the bank. For me, the price of a standard room is cheaper than a taxi home after a night out. It’s a no brainer. The room itself is very small but space is well utilised. The facilities are very clean, the shower is powerful and you even get a few coat hangers in an open wardrobe. The bed is a very small double but comfortable enough for an uninterrupted night sleep. If you’re hungry for breakfast in the morning, they do provide 24 hour light refreshments, available from reception downstairs (at an extra cost, of course) but if I were you I’d stick to local cafes such as Allpress Espresso where you can get a stonking flat white. The only negative from my stay was the fact that you didn’t need a key to enter the hotel at night. Anyone can just walk in off the street and that thought scared me slightly, particularly as I arrived back at the room earlier than my boyfriend who had decided to stay dancing for longer. I couldn’t possibly fault Tune in any other way though – it is excellent value for money if you’re looking for a no frills stay.